​Arthur's Letters Home During 1904. Yrs. of Dec 24th & 31st to hand, former enclosing one from Ned & latter from Trix. Also heard from Will. Glad you got my cable all right & hope Fin fixed up matter for you. I note Gerald is not paying off the money yet, but I suppose he’ll agree with his tenants later on. I’m writing Fin about investing the £1000 to my credit in bank or rather £900 now as you have borrowed £100. Will talks of buying Kilmacradone (?) or some such place, but I’ve no idea where it is or what it is. I suppose it will end in letting the Abbey for summer & living at cottage; you could be there May & June & when he returns we could go over to England, & spend two or three months. I intend leaving here or rather Sydney on 21st March by the “Aorangi” via Fiji & Honolulu to Victoria where I shall probably spend a couple of days, then on to Vancouver, Winnipeg, St Paul, St Louis, to see World’s Fair open & on to New York & Boston & likely sail from latter place if boat suits. Might get home about middle May. If you write to P.O. Vancouver letters to get there not later than April 10th, you will want to allow 12 days from the Tuesday or Saturday you write. After that C/o Cook’s, New York, same as last time. I asked Sis to find out the Putnams address in Boston & let me know as I might call on them if I have time while there & it is nice to know someone in these places. What a pity D. of N. [possible Duke of Norfolk] did not marry Trix. I go up tomorrow to stay with a friend up on the South Australian border. Yrs’ of Jan 6th & 14th to hand. I did not write last week; left it till too late, I was away on the South Australian border on a little driving tour with a friend & went down to stay on a station S. Australia. Very sorry to hear about Ned’s accident, I hope he will not lose his eye; poor Maurice must be much upset, ‘tho of course no fault of his. I note you think of taking Lindsay’s house, it certainly should suit you if you want to live in Ireland but being right on the village is, to my idea, a very great drawback, but you know I always did hate that village. Do not think of me in the matter, for I shall not be able to live at home & if now and then I were able to get home for a few months I should be perfectly happy wherever you are. Certainly if you intend to live in Ireland a small place near Celbridge should suit you, & the Lindsay’s house is very handy to Chapel, post etc & to the Wills. Nice for Evie having Daisy & Mary M. Trix writes from Buckland & says the Uncle has just given her a horse to hunt. Japan & Russia will cause some excitement next few months. Will you ask Willy to pay my sub. to Junior Court Club & I’ll settle with him when I get back, pay the ordinary sub. 2 yrs. I think it is, as I shall, I hope, be using it this year. Am sending you a cable to stop writing here. Is Lady Gwendolen sister of Sir R Talbot who is coming out here as Govenor. Thanks for Irish Times last mail. Yrs’ of Feb 3rd enclosing one from Aunt M. to hand yesterday. Why should Capt. N want more for the place than Lindsays paid; I suppose he knows you want it rather & I suppose its only natural he should want all he can get, but it is a nuisance only getting it from year to year. Glad to hear Evie is happy & contented, but her flat sounds small. A new departure of Daisy’s going to Rome! It has been wet & disagreeable last few days; a big crowd at hotel, never saw it as full, races & English v Australia cricket match being part of the attractions. I sail Monday week from Sydney. Will hope to hear from you at Vancouver P.Office & then c/o Cooks New York, letters to get there up to say 6 or 7th May. I heard from Nora & Brenda this mail, I was sorry to hear Unc. Willy had not been well, but it seems to have been a poisonous winter, I don’t think I could ever stand an English winter now, too beastly for words. We’ve been growling out here at the amount of rain, it has been the wettest summer for many years. It would be very nice to spend a month or so at Malvern, Aunt M. seems to have enjoyed it inspite [sic] of rain & cold, pity she does not live there instead of Leamington. So Fanny ???? is married. I fear I shan’t see Mary Dalglish this time. Yrs’ of Feb 11th to hand Monday & enclosed from Minnie Murphy. E’s flat seems small, pity when they did move they did not get something a little larger seeing a small person threatened. I heard from E. also last mail, she seems to be happy. Glad to hear Catherine Connolly is engaged, they all must be pleased. Very good of Kathleen Lindsay to send me letter to Mr Collier, but if she sends it here now, I won’t get it, as I leave Sydney on Monday for Vancouver. I know the Putnams live in Boston, but I shall probably go there & would like to know their address so that I can call on them, but if Kelly is in N. York I can get it from him, if not, does Kathleen L. know it. I know one or two fellows in N. York but not in Boston. Generally I far prefer meeting people of ordinary means than millionaires, they are usually far nicer, at least that is so out here, & I am told it is the same in America by those who know it. A millionaires idea of hospitality is generally to give you an enormous dinner which means indigestion for a week after. I hope Minnie Cruise has sent me her Chicago brothers address, will likely be there a day or two ‘tho I have already seen it once. I doubt if Capt. Mansell (?) will get £70 for the house, ‘tho of course he might from some hunting people it would just suit. You don’t mention letting Abbey yet, but of course there is lots of time. I suppose I shall find you at the cottage. Pity Kitten’s man is not a Ld. [Lord], but a cousin to one is something. I hope to go to Buenos Ayres in Sept. to have a look round, take too long that route now. We went ashore at Bahia [Brazil] & had a drive round in trams drawn by mules of various sizes, it is a pretty place from the harbour, but badly paved & rather hopeless when you get ashore. One starts by going up in a lift to the top part of the town. A tremendous lot of niggers [sic]. We get to Rio tomorrow & spend all day & possibly till Tuesday. Get to B. Ayres Sat. night or Sunday morng. Santos Wed. Smooth & cooler than it was. A good many get off tomorrow including my friend Ponsonby, who is son of old Sir Ponsonby Fane who is or was in the Lord Chamberlain’s office for so long; he is 80 he tells me, only retired couple of years ago. Got in here early this morng. & leave 2 p.m. tomorrow, so lots of time to see about. Came ashore & shown round by friends of man on board who I came ashore with & we dine with them tonight at their house. Having lunch up here, magnificent view & glorious day. It certainly is a lovely spot, far finer than Sydney harbour. We go up the Corcovado this aft. noon. Did the town this morng. best from a distance, narrow streets. I have practically decided to go back via Chile & the West Coast & via Panama & Jamaica home, make a change, no use coming back same way; they tell me the trip over Andes is fine. Don’t write to B. Ayres after this, in fact I’ll likely send you cable from B. Ayres. We arrive at Monte Video tomorrow morng. About 10 a.m. & stop 3 or 4 hours & then on to B.A. [Buenos Aries] where we are by way of arriving Sunday morng. About 10 or 11, a stupid day to arrive, we are due tomorrow, but were a long time at Rio [de Janeiro], best part of 2 days. We got to Santos Wed. morng. A left in evg. ships go about 3 or 4 miles up a river to the town & lie alongside wharf which is few yards from main part of town; went ashore & had a walk round, but it is not an interesting place, but greatest coffee exporting port in the world: used to be very bad with yellow fever, but pretty right now, they’ve drained it. Yesterday was wet & rather rough & beastly, but today lovely again. I enjoyed my stay at Rio & saw good lot in the time. Walked about & trammed in the town in morng. Lunched at an hotel high up & then took a light railway sort of thing up the Concorado from where you get the most glorious view of Rio, harbour & sea, quite the finest view of its kind I ever saw; the Concorado is over 2000 ft. & one has everything at ones feet so to speak, suburbs & all; it is a pretty place to look at from a distance, but a dirty narrow streeted badly paved town. In the evg. Ponsonby & I went to dine with his friends at their house, then took a moonlight tram ride to one of the suburbs by the sea, then back & to a music hall to finish up so did not do badly. I stopped ashore & pottered about next morng. & we left in aft.noon. The ???? ensemble is, I think, certainly finer than Sydney harbour, higher mountains round & the tropical foliage up the mountains helps it a lot. The line going up is almost all through tropical forest. We are still a full ship, a lot got on at Rio & Santos. I think of going back via the Andes & up West Coast & home via Panama, it makes a change, however I will see about it in B.A. [Buenos Aries] it would cost another £40 or £50, still one sees a lot more & the Andes trip they say is very fine, train, mule & coach & then train on Chilean side, takes about 60 hours from B. Ayres [sic] to Valparaiso. Good boats go up the West Coast & call in at a lot of places, lands one at Panama, cross to Colon by rail 40 miles & get one of the Royal Mail boats there once a fortnight for England & they call at Jamaica, Trinidad & Barbados. There is nothing along this coast I want to see again. There is a boat from Colon 24th Dec. which gets home Jan 9th which I may take. Would mean leaving B.Ayres Nov. 21st about, would give me 3 weeks which I daresay is enough, for from what I gather from people on board, there is very little to see there, they say B.Ayres is the Argentine & the Argentine B.Ayres; all flat & uninteresting & just see one estancia & say up to Rosario by boat & back by rail is all one wants to do & I quite imagine it is so. I’ll send you a cable if I decide to go the other way so as you should not write any more here, best write to P.O. Kingston Jamaica if I go other way. Already learned good lot about the Argentine from many on board. My eyes are troublesome again which is a nuisance, must try and get more of that lotion. Sick of ships food rather, but manage fairly well, but board ship is not a choice place to choose when one suffers from indigestion! I arrived here Sunday morng. early having come across from Monte Video by river steamer, left the “Thames” there in the morng. & had the whole day there with another fellow & saw all that was to be seen. Nice little town enough. Country just recovering from a revolution & things at 6’s & 7’s. Fine river boat, packed with people coming over here from Sat. to Monday. Left there 7 p.m. Here 4 a.m. but stayed on board till 6. This is a fine city, rather narrow streets bar the Avenida Mayo which is the show one; excellent tram service & well lit. Fine docks full of shipping which shows as well as anything what the country can do, but they have had good seasons & prosperous times & rather on the boom; a plague of locusts or drought would upset things a bit & both these objectionable things happen along now & then. It is a very dear place, far more than Australia or England, the dollar = 1/9 to 1/10 goes like 1/- at home or in Aust[ralia]. A good country to live out of once one has made ones pile. Of course in the country I suppose living is cheap. Met very nice fellow here, just arrived week before I did on the potter [?] & we’ve been going about together, he’d been 6 months in Mexico & talks a little Spanish. I dine with Julio Mulhall at the Jockey Club tonight, it is a very fine building & very comfortable, he has put me up for it; have not met him yet as he was out of town. Mrs Mulhall to whom I had a letter, is in England, I called there, he was ill, so did not see him. A Mrs Duggan I also called on with my letter from Mrs Mulhall, a fat common sort of Irish woman, full of money probably, nice house etc. She made herself pleasant in a housekeepery sort of way. Tuesday my friend & I went out to a Gymkhana at Hurlingham, a club the English have about 12 miles out, coldish wind blowing, but I saw certain number of ladies in smart dresses, all English bar two or three, it’s a nice place, polo ground, golf etc. Yesterday we went out to the Tigre River, about an hour by train & took a boat & went for a row up the river, landed on an Italian Restaurant & had tea. Rather pretty river, willows each side, great place in summer for boating. Been doing B.Ayres today, suburbs etc. Some rather nice parts, but quite an uninteresting town. Went to their best music hall 3 nights ago & had to leave, such a rotten show we could not stand it, awful, how they put up with such stuff I don’t know. Palermo Park was very gay Sunday, crowds of smart people driving about in smart clothes & indifferent turn outs, one or two good. Some of the “Thames” passengers are stopping here, comfortable hotel in a way, but only in a way. Just got letter from Mrs Woodruffe to ask me up if I like to go, 7 hours from here & 25 miles drive from station. Think I’ll go up Tuesday for few days, then back here & over to Chili [sic] about 22nd & see Santiago & Valparaiso & join the P.S.[?] “Victoria” there on 29th & go back via Straits of Magellan, due Liverpool 2nd Jan. Trip via Panama does not fit in, only Chilian boat running when I want to go & my inside in its present state would not, I fancy, improve with 3 weeks on a Chilian steamer. Then I can’t take my cabin trunk over Andes & not time to head [?] it round. Nothing to see here once one has seen an estancia, far better value for ones money almost any other place on earth. Will write again about letters, they will catch me at Monte Video about Dec 4th when we call there. No letters or papers by this mail in today, I had hoped for some, those 3 stray Spanish letters. Must only hope for next mail to produce something. Tomorrow morning I start at 6-30 a.m. for Casares, 7 hours train & 25 miles to drive & in due course I hope to arrive at the Woodruffes. Will return by train from there midnight Sunday & get here Monday morng. Following day a fellow & I propose taking a trip up the Uraguay [sic] river to Concordia & back, get back on the Sat. morng. It is about 300 miles & they call in at various places up the river. Who should turn up this afternoon but Fitroy Murray, just came out in the “Victoria” ship I return in, left week after me. Seems to have had bad luck in S.Africa & says times are bad there. I suppose he is going to try his luck here. I had not seen him for ages, but thought him very like a Murray when he arrived, & asked & found it was him. He had been home for a month. I dined with Julio Mulhall at the Jockey Club Thursday night, he seems a nice young fellow. Yesterday he & I went to the races & as hon. Member of Jockey Club it cost me nothing & had run of Jockey Club stand & whole place. Fairly good racing, a sand course, all nearly done & managed to get one winner; also we won 30 Dollars in a lottery on Sat. they have them every week, first prize 80,000 dollars worth winning. Mulhall dined with me here last night & he met estancieros* from Uraguay [sic] & I listened to their discussions & learnt a certain amount. I was very glad to see in last “Times” that they have had splendid rain in Australia a good crops assured. Must have a long jaw with Fitzroy this evg. wonderful how fellows turn up, he remembered my face he said but could not place me a bit when I went up to him. Yrs. of Oct 8th (to Lisbon) 13th & 17th to hand today & 2 Aust. [Australian] letters forwarded and several papers, but I much regret to say still no news of those letters you sent me to Madrid & which I never got, Cooks having sent them on to Salamanca & seemingly not got them back. I told them to send them to you if they arrived. It is too hard & annoying they were Aust. [Australian] letters as you remarked in your letter at the time that you had forwarded 3. I’ll write to them again to Madrid this mail. So glad every one approves of Court’s girl, have just written to congratulate him! I got back at 8 a.m. today from a very pleasant stay up at the Woodroffes; thay have a very nice estancia [estate] & live most comfortably & everything well done. They are both very nice, he is a particularly nice gentlemanly fellow & I should say they are both very lucky. He is well off as it is a good place & increasing in value every year. On Dec. 1st railway will be within 6 miles instead of 25. I left them yest. aft.noon at 4-30 & got in to Casano [?] at 7-30 & had dinner at hotel there & had to wait till 1.a.m. this morng. for my train, however got a sleeping car & did fairly well. Roads not too good, but they travel along, 5 horses & go full tilt whenever possible. 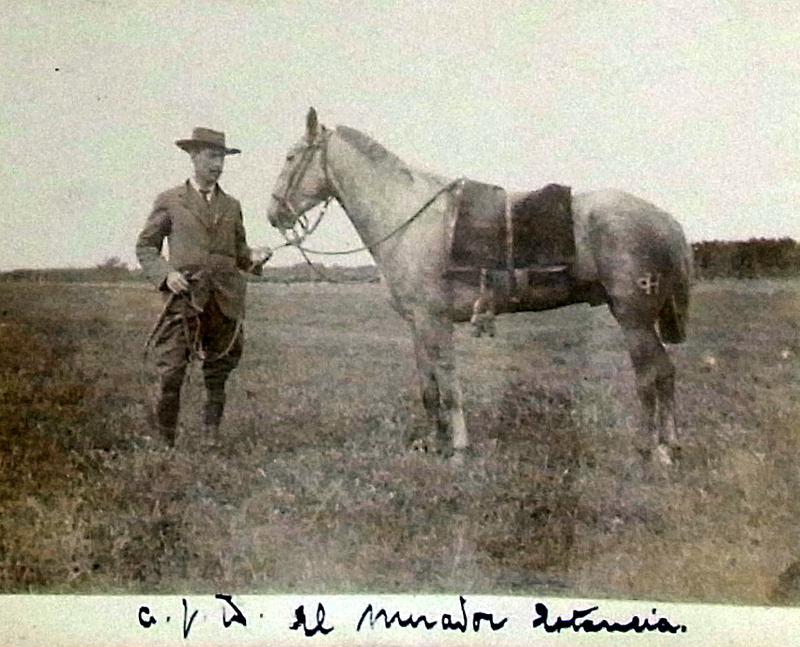 We drove & rode about & went over to a neighbouring estancia to tea one aft.noon, some English people called Campbell. His father is coming out next month & he will probably go home with him in March & Woodroffe follow later. Tomorrow morng. I & a friend start up the Uraguay river to Concordia & there stay the night & go on across Entre Rios to Paraná & back via Rosario, will be back Sat. I will have seen a fair amount by then. Country is very flat & great sameness about it. Everything looks green & well altho’ they say they have had a drought. I took certain number of photos up at the estancia, if good must show them to Mrs Murray when I return. All the shops or most of them closed today, they have all gone on strike; every one seems to be going on strike from what one hears, in fact a good place to get away from. Railways talk of having a go too. There seem a good deal of discontent. Fitzroy Murray went up country yesterday so I did not see him again but he left a note for me. He has gone up to some estancia & get an idea of the work, hope he gets on. Very windy country this, almost always blowing. I hope you are very cosy in your new house, hope to be over about Jan. 8th. Mrs Woodroffe is awfully nice, & like Mrs Murray in speech & manner. Yours of Oct. 26th & enclosed from Haddon & Co I got today at Royal Mail Office. I got a direct mail from Australia on Sat. Since I last wrote I & a friend I met here, an Irish fellow tripping round, went for a trip, up the River Plate to Salto in Uraguay calling at various places up the river; very pleasant time & I met 3 or 4 English people who live up there & had been staying here at this hotel; from Salto we went across to Concordia & from there by rail right across Entre Rios to Parana, stopped night there & then on to Santa Fe across the Parana river which took us 2 hours to cross there, winding through islands etc, from there we came back by rail via Rosario, so saw a lot of country & a look into Uraguay. I decided today to return via Panama & Jamaica & sent you a cable this evg. to that effect. 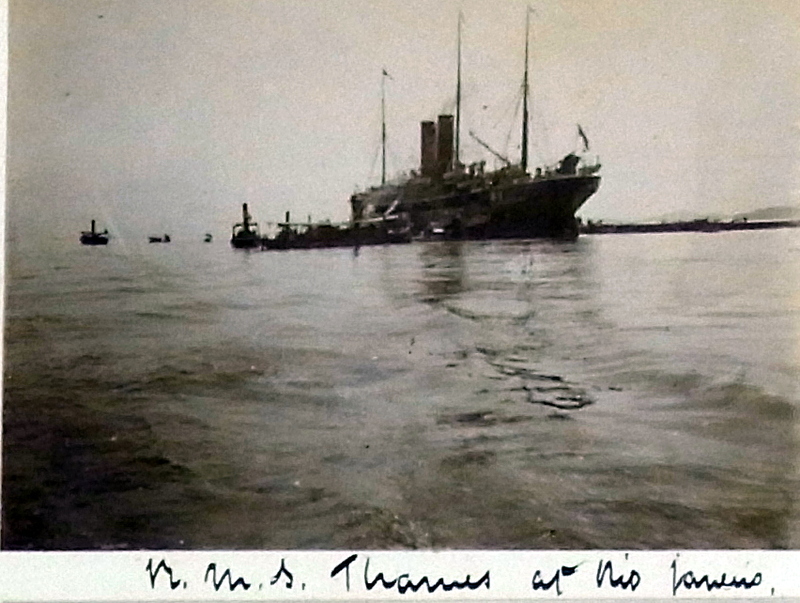 I find I can get all my baggage over the Andes on mule which I was doubtful about, & this being so it is a more interesting trip than round through the Straits & one calls in at many ports up to Panama, from there I cross by rail to Colon & get one of the Royal Mail boats from there on Dec.23rd, Jamaica 26th, & on to Trinidad & Barbados & due Southampton on Jan 11th. I know three men, all Americans, crossing the Andes to Chile tomorrow, so we shall be a nice party, one of the fellows I only met in the office this evg. he lived at the Grand at Melbourne for some time, it is wonderful how one meets fellows one knows. We start tomorrow at 11 a.m. & get Thursday night to Valparaiso. The Chilean boats are quite good they say & I take one on 30th due Panama Dec 18th. They stop 2 days at Callao, & one has time to go up to Lima. Will probably go up to Santiago from Sat. to Monday. I expect 2 of the Americans coming along tomorrow will be coming up to Peru by my ship. Yesterday was pretty hot & we dined by the lake in Palermo Park last evg. & went to battle of flowers they had after, started about 9 p.m. & went on for 2 hours or more, bright moon & lit up & decorated the whole long avenue, about 2 miles long, mile & half at any rate, it was for a charity & all the carriages had to pay 20 dollars, there must have been 2000 at least. 2 four in hand teams & several small carriages, smartly dressed women & flowers flying about. Everyone is on strike here, cabs are all out now & one is reduced to tram, warehousemen were all out, then shop assistants & tram & railway men next. They broke window of this hotel & I believe killed a policeman. Good place to be out of just now. We arrived here last evg. from B’Ayres after a good & somewhat tiring trip, but a very interesting one & some fine scenery. I found an American friend who used to live at the Grand, in Melbourne, coming over too & knew 2 others also coming, then when changing trains at Mendoza at foot of Andes, I came across an English fellow I know & he said he was coming over too, so I had plenty of friends; rather luck this last fellow asked me if I’d like to ride on the engine coming up the Andes, of course nothing I’d like better, so after first 15 miles or so through not very interesting Pampa, we climbed on to cowcatcher where they had two little seats & had a fine ride for about 30 miles, never ridden on cowcatcher before, rather nice & one gets grand view of everything. The scenery is grand rather than pretty, big bare mountains, next to no vegetation & covered with snow in higher parts, 2 or 3 Condors flying about, otherwise no life of any kind. We stopped night at a very rough sort of place built of tin & mud, 3 or more in a room, we managed to get 3 beds. When we got up yesterday morning it was snowing & cold. Started on mules at about 8 a.m. & went up very steep part, snowing pretty hard, but well wrapped up; it is rather fine & after stiff climb got to the top of pass, La Cumbre, 13000 ft. above sea; it is the frontier between Chile & Argentina & there is a huge statue of Our Lord with a cross in his hand, by way of denoting peace between the 2 countries, it is rather fine & impressive right up among the huge mountains & snow falling all about. Just after we left down into Chile snow stopped; it is a long & in parts very steep descent this side, & far more snow this than the other side, in places over our heads each side of our track. Mules are wonderful the way they get along & climb about. 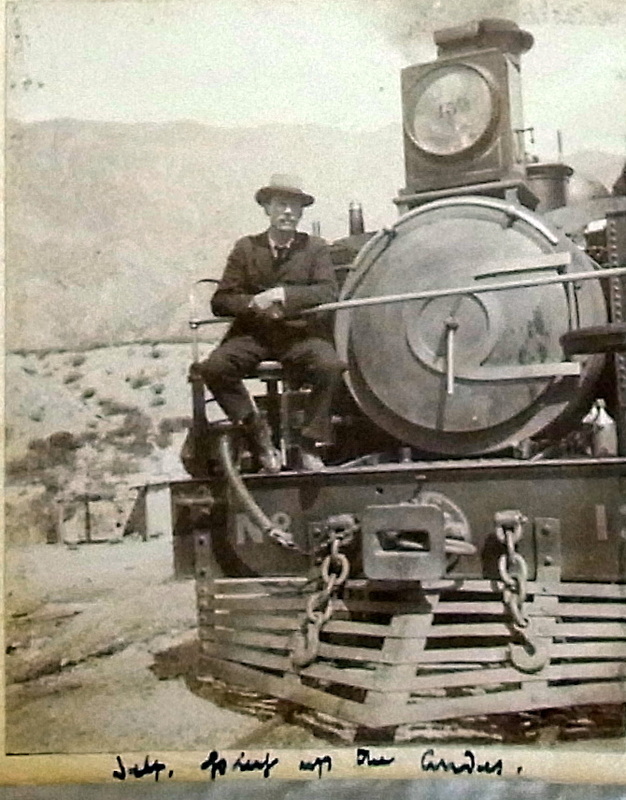 We got down to Juncal [Chile] soon after noon where we had something to eat , then took coach for 2 hours & then Transandine line this side, a contractors train, very rough & uncomfortable but some fine scenery coming down the valley to Los Andes, about 1 ¼ hrs. where we got Chilean State line, then one more change & we got here 10-30 last night. My American friend is staying here & on Sat. or Sunday we go up to Santiago for couple of days when I return here & sail Wed. evg. for Panama. They have given me cabin to myself. It is a Chilean Co. but English Captain & engineer & they say quite comfortable. Shall get no news now till I get to Jamaica. 2 Americans who came over with me from Argentina one also going up in same boat but only to Iquique [Chile] I think. Chileans are much more ?????????? than Argentines. This may get home a bit before I do. With the usual casualness of these countries the boat has been postponed two days & we only sail tonight 7 p.m. instead of Wed. evg. when we should have gone; still I have 5 days to spare at Panama & don’t mind if it is reduced to 3. My Yankee friend & I went up to Santiago for couple of days, it is about 5 hours journey from here. Nice city situated on a plane at foot of the Andes, which looks nice their being still covered with snow. A fine Cathedral, Plaza & 2 parks, one we went to Sunday evg. & saw the smart people driving; a very nice park & big trees, all older looking than B. Aires park they fuss so much about. I quite enjoyed Santiago & the scene at night on the Plaza where the band plays is unique, crowds of smartly dressed & many pretty girls walking round & a long string of men walking round in opposite direction , stare at one another & bow to friends, but never walk together. It opens ones eyes to come round these countries, at home one does not realise such cities exist. Many of the Chilean women are very pretty, far more attractive than the Argentines & they don’t get so fearfully fat. Would not have missed seeing this country for anything. I dined with an Australian & an American last night & they took me to the theatre, an Italian Opera Co., fair. Streets very bad in this place & an antiquated system of horse cars with rails several inches above or below level of rest of street. Met some nice fellows here at club & about. I hear it has been cold & snowing at home, see it in cables. It must be on some bank, there, the correspondents of Bank of Ireland whoever they are, let me know in letter. Things are in a real mess, can’t go into details now, but smallpox broke out on board the west coast steamer & we’ve been vaccinated, fumigated, & generally annoyed & to cop it all the Royal Mail Co will not take us here & as a last resource the French Co are taking me & one or two others, 2 others, a very nice Ecuador couple. I’m awfully short of money, can just get to Bordeaux where we are due about 14th. We call at a lot of places including Martinique, La ???? ?, Venezuela etc., perhaps more interesting than other route, but I get no mail & am landed in a place I don’t in least want to go; no more of these places for me, this is just about the limit; if the French people had not taken me I’d have had to wait a fortnight in this hole. Am going on board tonight, as this hotel is impossible. Will be scarcely any passengers I fancy & will do my French good, but no English to fellows I suppose & no one to bridge away time with. The smallpox broke out before Collao, one case was landed at Collao & another at Panama yesterday. I was vaccinated at Collao & again yesterday morng. & then one [sic] you find the ship refuses to take you this side it is just about enough to try anyone’s patience. I suppose I’ll be home about 16th, London then anyway. I’ve asked Purser of Royal Mail boat to call for my letters etc. in Jamaica & take them home for me. I shall have about 5 francs when I arrive I suppose, so hope to find draft or get it within 2 or 3 days of my arrival.